If you are in charge of your class reunion, please email Kristin Matzke with the details. She will then post the information here and on the Alumni Facebook Group. Kristin can also help with classmate lists. Additionally, if you want assistance organizing the event (for example, location coordination), feel free to email Val Holzhueter. Join your classmates in celebration of 20 years on Saturday, June 8! Please register by June 1 via this Google form. 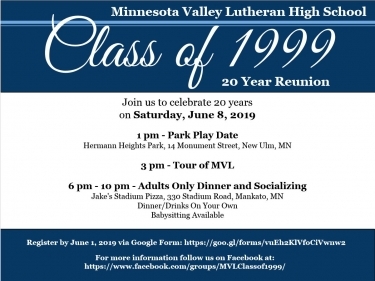 Also, for more information, you can join the MVL Class of 1999 Facebook group. 1:00 P.M. – Park Play Date at Hermann Heights Park in New Ulm. 6:00-10:00 P.M. – Adults Only Dinner & Socializing at Jake’s Stadium Pizza in Mankato. Dinner and drinks are on your own. Babysitting is available. There’s no place like Homecoming! Mark your calendar now for October 4-5, 2019. On Friday night, check in at the alumni table next to the Johnson Field entrance and get free admittance to the game. The tailgate party with pork chop dinners starts at 6pm and the Chargers take the field at 7pm. The annual post-game social follows at the New Ulm Community Center just down the block. This free social is open to all alumni, friends, parents, and supporters. Enjoy complimentary snacks and adult beverages, plus entertaining games and exciting door prizes. 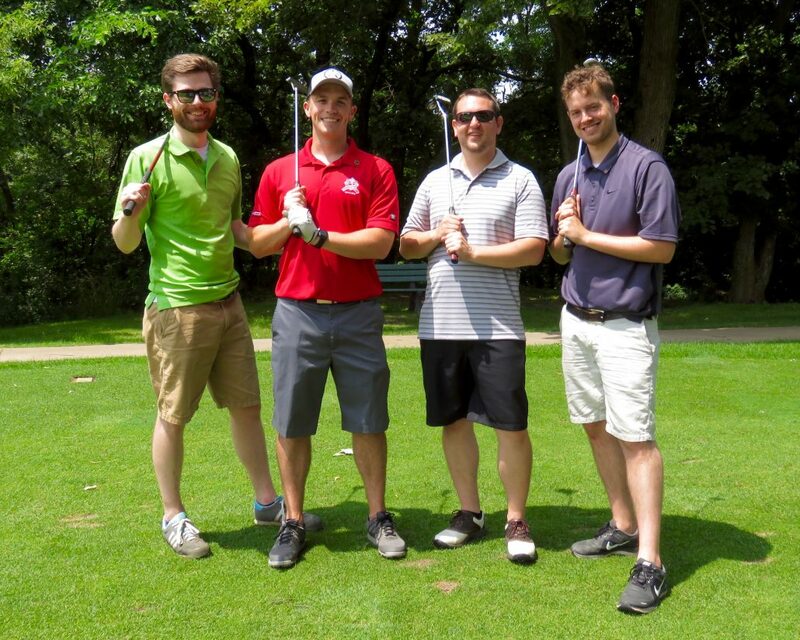 Then on Saturday, all alumni and their guests are invited to the third Golf Extravaganza at Minneopa Golf Club in Mankato. This $25 event gets you nine holes of glow-in-the-dark golf, a drink ticket, and dinner! Registration will open in the fall. Note: Postcards will be mailed to all alumni the week following Labor Day with details about Homecoming Weekend. If you do not receive one, MVL does not have your current mailing address. Please email Kristin Matzke to update that information. Visit the News & Events tab for information about MVL’s major events of the year. Also look at the school calendar for all upcoming events.